Now this is what i called a fortunate bounty. Lol! 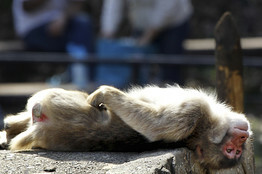 Mishima, a vacation town that sits at the foot of Mount Fuji in central Japan, said Wednesday it will pay any citizen who traps a monkey indoors 200,000 yen ($2,390) in cold, hard cash. Plus, of course, compensation for any property damage that might ensue while said trapped monkey awaits the arrival of authorized removers. The decision comes after numerous reports of ravaged monkeys attack people and bite them off. Whoow, Scary! Yeah, as said, a center regularly flashes on the updates of the latest monkey sighting under a name “a biting monkey alert” that announces where the monkeys are heading and urges people to trap it. The announcement in particular is very clear in asking the people to trap it , and not to hold it fearing they be bitten as well. But so far, no success, as the monkeys from the wild take the battle to the core! “It’s dangerous so we’re asking people to trap the monkey, not try to capture it. Otherwise they risk getting bitten,” said a Mishima town official who works in the agriculture department. So far, the 200,000 yen bounty hasn’t made a bit of difference. The monkey continuous to cause ravaged by biting people of the local. Previous: A Mouse story of Unity!